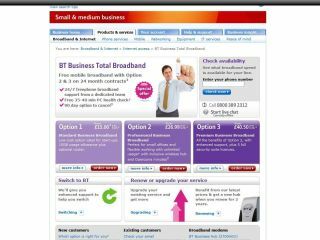 BT Business customers are being offered free mobile broadband as part of a new all-inclusive deal. Those that take options 2 or 3 on the BT Business Total Broadband plan can take advantage of the offer, providing they sign up for a 24-month contract. The deal will also see them given a plug and play USB 3.5G dongle and access to the 100,000 BT Openzone hotspots in the UK and Ireland. There's only a paltry 1GB of 3.5G data allocated on the plan, although 2,000 Wi-Fi minutes will take a while to get through, even if it is for a year. There's also a free PC health check included as part of the offer... helpful for when you 'accidentally' access an adult site when out and about and download half the internet's worth of spyware. However, Option 3 also includes five security licenses, so maybe you'll be safe for the time being.